If you are building a software application, it is essential that you test it for performance. This way you experience the limits of your cloud deployment in a TEST environment and not when real customers suffer performance degradation. Your performance tests should answer questions such as: how many users can my app handle? where are my app’s bottlenecks? where is my app’s breaking point? how much will it cost me to handle X amount of users? Just because AWS powers some of the biggest applications in the world, this doesn’t mean your particular cloud deployment is ready to handle millions of users. You still need to performance-test your software and fine-tune your AWS components. There are many tools that you can use to simulate load on your system; a very popular one is JMeter, a free open source application that simulates user load and records performance results. You will also have a CloudFormation template that automates the setup of JMeter and CloudWatch metric filters; this will save you a lot of clicks and CLI commands. I am also including a sample JMeter test plan to get you started. In the future, the only thing you’ll need to do is upload your own JMeter test plan to an EC2 instance, execute it and see your metrics flow into CloudWatch in real-time. Cool, isn’t it? … but wait, JMeter already has a GUI where I can see my test results. Why would I want to export my test results to CloudWatch? First, let’s talk about CloudWatch. 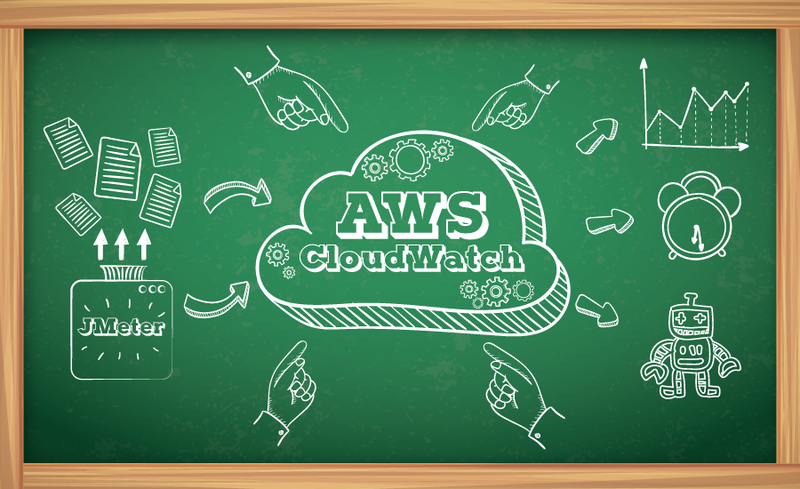 CloudWatch is AWS’ metrics aggregation service. All AWS services publish metrics to CloudWatch, which allow us to monitor the health and performance of our AWS cloud components. We can also publish custom metrics to CloudWatch, which enables us to monitor application-specific events. CloudWatch Logs allows you to export log records from your servers into CloudWatch and create metrics based on patterns present in your log files, such as timestamps or keywords. We will use CloudWatch Logs to export JMeter test results from your server into CloudWatch metrics that we can monitor and visualize in the AWS console. Even though you could view your test results using JMeter’s Response Time Graph or similar listeners, you will eventually need to correlate your JMeter test results with other performance metrics that are only available in CloudWatch. You want to know what effect your load test is having on key AWS metrics, such as CPU utilization, CPU Credits, Disk Read/Writes, BytesIn/Out, System Health Checks, etc. Most importantly, you want to see how these AWS metrics will affect your customer experience. Correlating test result metrics with AWS metrics will be easier if you have them in a single place, such as CloudWatch. Chances are you will have to run your JMeter tests in server mode (and not from your laptop). Since there is no JMeter GUI available in server mode (unless you do remote desktop), you will have to export your test results somewhere anyways. In this example, we will export JMeter test results in real time using the CloudWatch Logs agent. If your performance test metrics are stored in CloudWatch, you can set up alarms in case your test does not run as expected. This is particularly useful when you are running long tests (hours or days long) and you really don’t want to be glued to your computer monitoring how the test is doing. If your JMeter results are aggregated in CloudWatch, you can automate virtually any step in your test. This opens up a lot of cool test automation use cases (i.e. stop/trigger a deployment, stop/trigger tests, add/remove capacity, notify someone, etc). The list is really up to your imagination and business needs. Once log data is in CloudWatch Logs, you can stream it to other AWS services, such as Kinesis, Lambda or Elastic Search for further processing. This opens up the possibility of very detailed analysis of your AWS infrastructure metrics and seeing what effect they have on your customer experience. All of this before you deploy a single line of code into a Production environment. You can automatically move your test results from CloudWatch Logs to S3 for archiving or later processing. Since your test results data will be fed into CloudWatch in real-time, you can terminate your JMeter servers when you’re done testing and save money on computing costs. Since you’ll have a Cloud Formation template, it will be trivial to launch a new JMeter server and set up the required CloudWatch metric filters when you’re ready to test again. This is what the deployment will look like: you will have an EC2 instance with JMeter installed in it as well as the CloudWatch Logs agent; this instance generates load to some target (a web server) and the CloudWatch Logs agent will publish your test results log entries to CloudWatch. CloudWatch will parse incoming log entries and convert them to CloudWatch metrics. Log entries can also be forwarded to S3, Elastic Search, Lambda or Kinesis for further processing (CloudWatch Logs subscriptions are not included in the CloudFormation template). The diagram below shows a laptop because I recommend creating and validating JMeter test cases in your workstation (using the JMeter GUI) before uploading them to the EC2 JMeter instance. I will assume the following knowledge for this section: you are familiar with EC2 key pairs, you know how to SSH to your instance and you can execute basic commands in a Linux terminal. You have to make sure you have at least 1 EC2 key pair in your account. If not, you can follow the steps in the EC2 documentation to create one. I have created a CloudFormation template that takes care of: creating an IAM role for inserting data into CloudWatch Logs, launching an EC2 instance with JMeter 2.13 installed in it, installing the CloudWatch Logs agent in the EC2 instance, creating a CloudWatch log group and metric filters for the JMeter test results (transaction count, latency, response code count, connection times, sent/received bytes). This template also downloads a basic JMeter test plan to the EC2 instance. The first thing you need to do is launch the CloudFormation stack. This will create one t2.nano instance at a charge of $0.0065 per hour and 9 CloudWatch custom metrics. The CloudWatch free-tier includes 10 custom metrics, after that you’re looking at $0.50 per metric per month. CloudWatch Logs charges $0.50 per GB ingested and $0.03 per GB archived per month. If you run the example in this post you should not incur in significant CloudWatch Logs charges (you will be far from ingesting 1GB of data). Don’t forget to delete the CloudFormation stack when you’re done, so you only pay for what you use. You can find more information on CloudWatch pricing here. If you are interested in the manual steps required to configure JMeter and CloudWatch logs, I describe the steps in this page. A JMeter test plan is an XML file that describes the behavior of your test. Since we don’t want to deal with XML directly, the best approach is to create your test plan in your computer using the JMeter GUI. This means will have to install JMeter in both your workstation AND the server you will run your Meter tests from. Trust me, it’s worth it! Server name or IP. Here I included the public DNS of my load target (the website I am sending HTTP requests to). Write File Header: these are the labels that will be included in the first row of your file. I recommend using a header row for troubleshooting purposes. If everything looks good, you can copy your local .jmx test file (in this example I named it “basicHttpTest.jmx”) to your EC2 instance. Don’t forget to update “Filename” in Flexible File Writer first, so it points to the location of your results log file in the EC2 instance (and not the value you configured for your local computer). Make sure JMeter is writing results to the Filename specified in the JMeter test plan. The full documentation on how to get started with JMeter is here. Once you start the JMeter test, let’s take a look at CloudWatch Logs. First go to the CloudWatch console and click on Logs in the left navigation bar. If I click on this Log Group, there is a list of Log Streams. In this case we are looking at the ‘jmeter-server’ log stream that was created by CloudFormation. And now the final step. At this stage we can see our log records flowing nicely into CloudWatch. Log entries are parsed and transformed into CloudWatch metrics using metric filters. These filters are automatically created by the CloudFormation template. The official documentation on metric filters is here. One thing to consider is that CloudWatch does not offer metric math, such as P99, P50, variance, etc. If those metrics are critical to your test results, then you would have to implement a process that calculates metric math. I’m planning to implement a solution to this problem and write a post about it. Once you’re done testing, don’t forget to delete your CloudFormation stack, so you stop paying for the resources you have created. You can automate the creation of CloudWatch metrics from JMeter test results. This will enable you to analyze how user load will affect your customer experience and you will be able to diagnose and correct performance issues uncovered during load testing. Also, having your test results in CloudWatch will make it easier to implement test automation and DevOps tasks in your AWS cloud infrastructure. Launch an EC2 instance with an EC2 Instance Profile attached to it. Create a JMeter test plan and use Flexible File Writer to write the test results into a log file. Create metric filters, so CloudWatch Logs parses incoming log data and creates metrics. You can modify the CloudFormation template so it loads a test plan of your own (you can add a parameter to the template). You can also modify the User Data section to start a JMeter test on instance launch. This way you can kickstart performance tests from a deployment pipeline and get actionable results in CloudWatch without executing a single manual step. Create a CloudWatch Logs subscription to Kinesis or AWS Lambda for further processing of your log data. More information on that is here. You can stream log data to ElasticSearch, which could be really handy for further visualization and search capabilities (using Kibana). Read here. You can also export your log data to S3, for storage. You can create alarms that trigger or cancel deployment activities based on your test results. For example, if you start seeing HTTP 500 erros, automatically roll back a deployment or send a notification. Are you launching soon or want to make sure your products don’t crash? I can certainly help you with planning, designing, executing and fine-tuning load scenarios for your application. Just click on the Schedule Consultation button below and I’ll be glad to have a chat!